While it wasn’t my main reason for heading to Austin, TX, I was lucky enough to get some quality birding in while I was down there. I got to see 3 areas: Hornsby Bend Bird Observatory (aka wastewater treatment plant), Emma Long Metro Park and the Lady Bird Lake/Austin Lake Trail, and was lucky enough to check out the first two with a fellow NJ Birder, Bev Robertson. My first full day there, Bev (@BirdingBev) and I decided to taxi our way 10 miles out of town to a local wastewater treatment plant known for a good congregation of birds around this time of year. Entering into the facility, a bunch of Boat-tailed Grackles were manning the fields, with a few Eastern Meadowlarks mixed in. A lone Crested Caracara flew overhead as we were walking toward the ponds. The ponds were actually quite full of waterfowl, particularly Northern Shovelers which were everywhere (probably 2,000 or so). 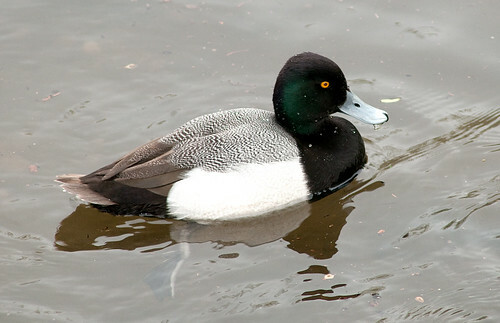 There were also a bevy other other ducks – Redheads, Lesser Scaup, Mallards, Ruddy Ducks, American Coots, Eared Grebes, Green-winged and Cinnamon Teal. 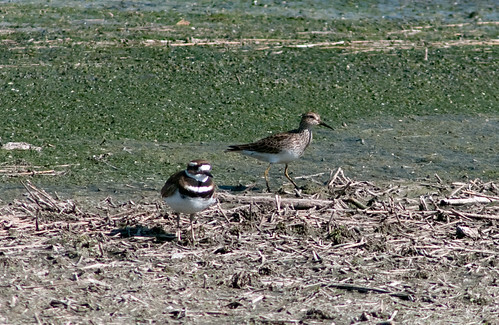 Along the edges of the ponds were a number shorebirds: mostly Lesser and Western Sandpipers, but with an occasional surprise: a single Dunlin, a Pectoral Sandpiper and a bevy of Killdeer – probably close to 2 dozen flying around. But the most maddening shorebirds were the number of Wilson’s Snipe which were nearly impossible to see … until they flew up in front of me. I knew where they were and I’d be staring right at them, only to have them flush when I took one step too many. Mixed in with the shorebirds were some sparrows – Song and Savannah mostly, including a leucistic specimen that had Bev and I struggling to identify. I later found that one of the sparrows was actually a Vesper sparrow*, a new species for me. 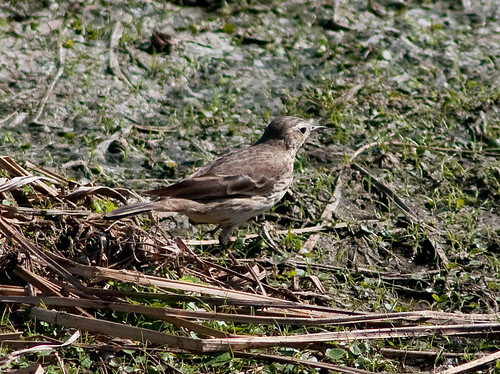 And running along the muck was a small thrush-like bird with a bobbing tail – an American Pipit*, another lifebird! We found a few songbirds and other species flittering around, including a hunting Merlin, a pair of Great Blue Herons, some cardinals, chickadees and “butterbutts”. Not a lot of great photographic opportunities but a good day in any case. 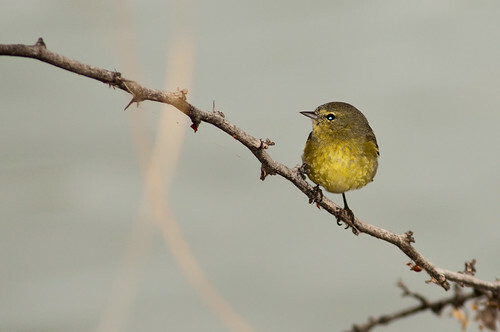 The next day, Bev and I joined up with another birder visiting Austin to go looking for the Golden-cheeked Warbler*. An endangered species that breeds only in the US only in Texas, they had been seen at Emma Long Metro State Park so we tried there to see if we would be lucky enough to see one. 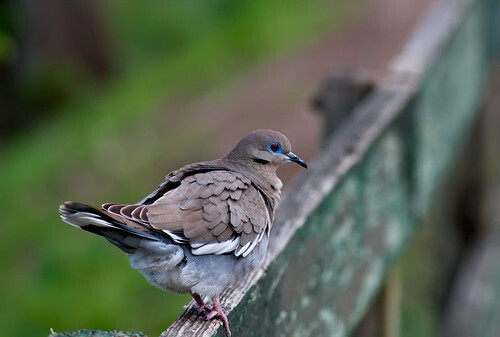 It turns out that we saw several, although they were a real pain to locate even when they were singing clearly and often. I would say that we heard or saw nearly a dozen of the little colorful birds, their distinctive calls buzzing from high in the trees. 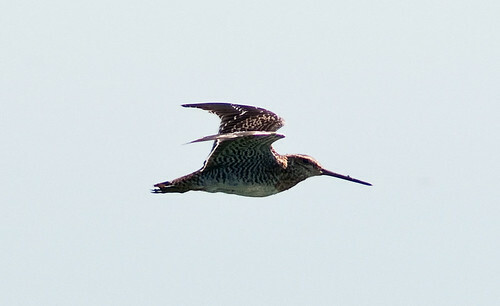 I managed a few shots but it was tough to get a good one – still, these beautiful birds were simply worth seeing at all. The park was populated by a number of other cool Texas birds, including the gregarious Black-tufted Titmice, White-winged Doves and a Spotted Towhee but these warblers were by far the highlight of that trip. My last day in Austin, I went out early morning to see what I could find down along the river. The weather wasn’t great – a bit chilly and overcast – but the birds were still fun to see. Several Mute Swans floated down the river, along with several rafts of Lesser Scaup. Another set of waterfowl were along the opposite shore of the river, too far for me to ID immediately but I would later ID them as Greater White-fronted Geese, a fourth new species for me on this trip Turns out they were just domestic geese. Walking along the path, I saw several other species of waterfowl (mallards, Canada Geese, Gadwall, Pied-billed Grebe and a single Eared Grebe), lots of boat-tailed grackles, cardinals and song sparrows and a pair of nest-building Carolina Wrens. 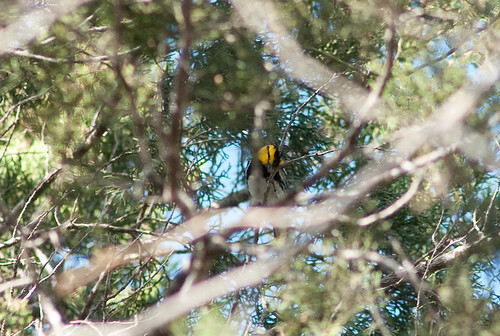 Near the end of my hike, I came across two surprises: an Orange-crowned Warblers and a Black Swan, which was beautiful but obviously an escaped bird. Looks like you had a great trip. I love Austin … I need to get back there sometime. So I have to ask, wasn’t the wastewater plant smelly? @Apertome — just seeing this now. Never got a notification you left a comment. I loved Austin – need to write my SxSW post. As for the wastewater treatment plant, they usually don’t smell too badly because they hold the treated water. There was one section near the ‘holding tanks’ that was somewhat foul, but mostly it just smelled like mud.